In what ways are organisms in aquatic environments connected to each other? Organisms in aquatic habitats interact with and depend on one another in various ways. An ecosystem is a community of living things with its physical environment, functioning as a unit. This unit is designed for 4th grade but could be adapted for use at any of the intermediate grades. 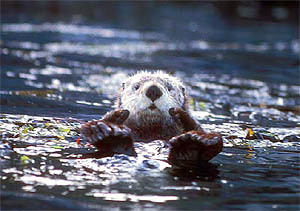 Students develop an understanding of how organisms in aquatic environment are connected to each other through four investigations that weave together the story of “The Case of the Missing Sea Otters.” Students participate in a sampling simulation, make predictions, and try to solve the mystery of the missing otters. They then apply their knowledge of ecosystems to their local aquatic environment. Finally, students share their collected data with other classrooms around the state. How are things in an ecosystem connected? Students read a mystery story about sea otters in the Aleutian Islands and examine an accompanying population graph. They identify information that they will need to help solve the missing sea otter mystery, and explore ecological relationships in the sea otter environment using Web sites, video clips, and readings. Information is shared with the class and/or summarized on clue cards, and students then create murals showing the sea otter/kelp bed ecosystem. Investigation 2: How Do Scientists Learn about Ecosystems? How do scientists learn about ecosystems? Students revisit the sea otter mystery story and discuss what scientists did to study sea otters in the Aleutians. They simulate the observation, identification, sampling, and counting methods used by scientists in two different activities, then reflect, discuss, and pose questions about scientific data collection. How do organisms in an ecosystem depend on and interact with each other? What happened to the sea otters? Students examine hypotheses and evidence related to the causes of the sea otter decline. They narrow down the hypotheses to one, then play a food web game to help them better understand relationships in the kelp bed ecosystem. They predict the outcome of an experiment to test the killer whale predation hypothesis and put together some of the big ideas about interactions in ecosystems to come up with plausible explanations for the sea otter mystery. Finally, they evaluate whether the hypothesis has been proven. They reflect on their learning by diagramming the sea otter’s food web and predicting what might happen if parts of the ecosystem changed. What are the elements of our local aquatic ecosystem? Students prepare for fieldwork and then go into the field to practice and apply some of the skills and knowledge that they developed while solving the sea otter mystery. Depending on local opportunities, the field trip may take the form of an ecosystem mapping exercise, a river or stream walk, or a coast walk survey. Students return to the classroom to analyze and share their data after the field trip. After completing the four investigations, students share their learning through a school-wide celebration, and share their collected data with other classrooms around the state.